David Meisinger (no campaign site) previously served on city council (first elected in 1996, again in 2002 and resigned in 2003) and served two non-consecutive terms as mayor (most recently losing to Jenny Halverson in 2016). He runs a residential and commercial contracting business. I’ve written extensively about the inappropriate behavior of David Meisinger and how he shared falsehoods and distortions during the lone candidate forum he attended. His behavior is unbecoming of an elected official, so let’s not talk about him like a potential elected official. With what I’ve written above about Meisinger, you might think I’d be happy to vote for anyone who is not Meisinger. You’d be right. But in Wendy Berry we have a candidate who is not just not Meisinger, we have a truly incredible person who I think will serve this city well. So rather than simply campaigning against Meisinger, I’ve been campaigning for Wendy Berry. I’ve knocked doors, dropped lit, written postcards, put up yard signs, and more. Because I believe Wendy Berry is going to be a great city council member. I wrote a detailed post about Berry’s position on the issues during the primary. Those positions haven’t changed, so go read that. Instead of repeating myself on the issues, let’s hear directly from Berry herself. 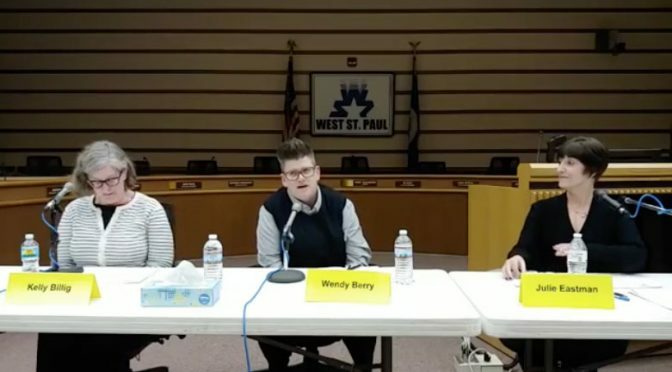 At the Women of West St. Paul (WoW) candidate forum, Berry talked about why she decided to run. She talked about watching city council meetings and not liking how people treated each other. She met with Mayor Jenny Halverson to find out more about running. I love this quote. Because you don’t need all this experience to run for office. We have a great city staff and there are so many knowledgeable people in this community to help. Simply having experience doesn’t mean you’re going to make the right choices. Too often we lock people out of opportunities because they don’t have experience, but then we never give them an opportunity to gain that required experience. Part of being good in a job like this is recognizing when you don’t know it all and being willing to learn from others. With her understated humor she defused an issue one person raised when I tried to talk up HR. Berry went on to tell a story about managing a department and winning an award as a place where employees loved to work. That tells me she doesn’t just have experience with policies and forcing people to get along, she knows how to create an environment that gets the best out of people. We need that in West St. Paul. OK, so how do we do that? How can we make West St. Paul the best place to be? Engaging people sounds great, right? But what about all the conflicts we’ve had on city council with the sexism controversy and personal issues? With the complaints of sexism on the city council, many people have been pushing for more diversity. Unfortunately, some on the city council haven’t set a great example as they try to take credit for the work of others, insist that under-represented groups need to do the work themselves, or chastise more women for not running. It’s especially insensitive given the climate of targeted harassment and vandalism against women. And Berry speaks to this too. Berry has responded to that targeted vandalism by organizing a tire changing clinic for women. So I’m voting for Wendy Berry in West St. Paul’s Ward 3 city council race. You can make your own decision (but, c’mon, please don’t vote for a bully) and then vote on Tuesday, Nov. 6, 2018 (or earlier). The West St. Paul city website has details on where and how to vote. You can vote early with an absentee ballot, either by mail or by stopping at the Dakota County offices.